Schedule a Residential or Commercial Cleaning Service in April, and we'll donate 10% of the proceeds to the homeless animals at the Cape May County Animal Shelter & Adoption Center! We are also collecting donations for the shelter which can be left with the Crew Chief at the time of service or to make other arrangements, email: marketing@SERVPRO9011.com. Thank you for helping our furry friends at the Cape May County Animal Shelter & Adoption Center! SERVPRO of Cape May County is a trusted leader in the restoration industry, and our highly trained technicians provide 24-hour emergency services. We’re dedicated to responding faster to any size disaster with the training, equipment, and experience to respond to your restoration or cleaning needs. After the damage is repaired, we offer Reconstruction Services to restore your property back to preloss condition. Guest Speaker Services for Seminars & Meetings! We would be happy to host a delicious breakfast or lunch at your office and connect with your colleagues. We offer a wide range of residential and commercial services that may help your clients and educate you with industry-specific tips to prepare for emergencies. Our presentations are delivered by a franchise professional trained as a presenter. Our services include: Post construction, HVAC, carpet, drape, and upholstery cleaning, water extraction, fire damage cleanup, pet odor removal, bio-hazard clean up, commercial services, and much more! For more info, contact Harold Lapp, 609-624-0202 or Email. Recent Guest Speaker Appearances: Berkshire Hathaway-OC & SIC, Sea Isle Realty, Long & Foster-CM, ReMax Beach Home Realty-SIC, Jersey Cape Realty-CM, and Berger Realty-OC. Continuing Education Seminars - Save The Dates! Continuing Education Seminars at No Cost for Insurance Professionals! 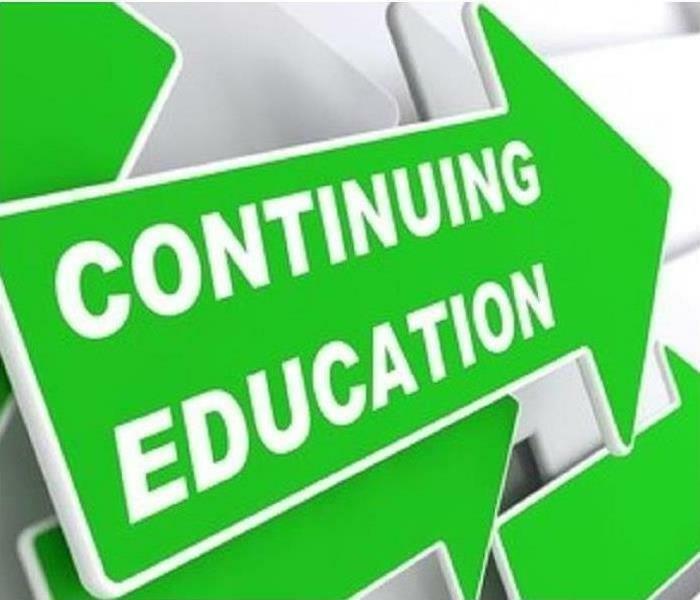 SERVPRO of Cape May County will be offering Continuing Education seminars to insurance professionals in 2019. Seminars qualify for credits in New Jersey and Pennsylvania and are free to Insurance Professionals (complimentary dinner included). All dates are subject to change with notice. For more information, please contact Minerva at 609-624-0202 or email! Water damage is one of the most common and costliest disasters your home may suffer. Things like a burst pipe, a malfunctioning dishwasher or tide flooding are just some of the many ways water damage could strike your property. Dealing with water damage is enough of problem, but it can have a long-term impact on your home. Mold usually follows water damage, as mold can begin to grow and flourish within 24 to 48 hours after moisture exposure. When considering the different ways to protect your home, it is helpful to break it down by areas of impact, such as crawlspaces, kitchens, bathrooms, flooring, and ceilings. A way to prevent water damage in basements and crawlspaces is to ensure there is no water seeping in. Do this by resealing vulnerable areas, making sure water drains away from your home and installing a backwater valve. The most common way your kitchen and bathrooms will suffer water damage is due to plumbing issues and appliance failures. 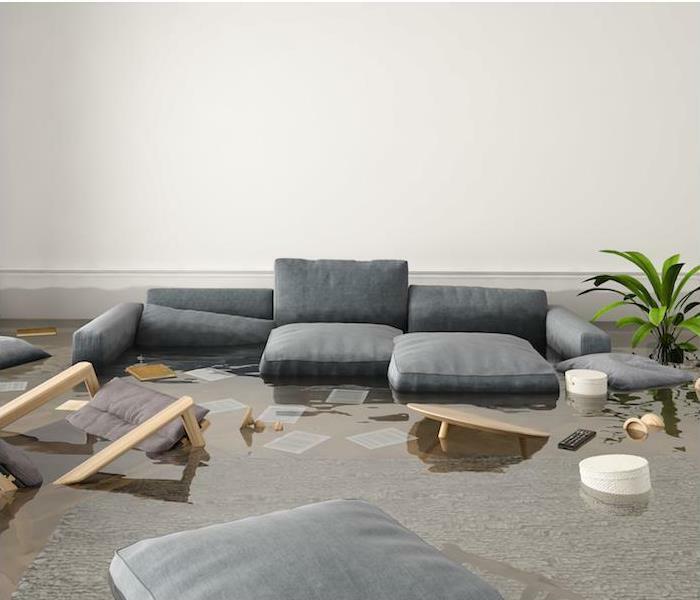 Protecting your possessions from water damage may not always be possible, but there are things you can do to at least decrease the amount of damage and loss. Store items in waterproof bins and keep them up off of the floor using shelving, especially when you are storing items in a basement or garage. If your home does experience a water damage situation, you can stand a good chance at salvaging items that can be dried out within 48 hours. You’ll want to contact your insurance provider immediately and evaluate the extent of the water damage as well as identify the type of water that is involved. Water from rain, condensation or leaky pipes is considered “clean” water. Water from dishwashers, washing machines and clean toilets is considered “gray” water. Water from sewage or serious flooding from nearby rivers is called “black” water and can cause serious health problems. Following a water damage disaster, hopefully you will be able to safely get to your home and get it dried out, dehumidify the area, remove wet objects and disinfect remaining materials within the 24–48 hour timeline before mold starts to grow. For your books and papers, here’s a pro tip: Freeze wet books, photos and papers in a frost-free freezer to buy some extra time. This prevents mold and mildew from developing and causing more deterioration. Once able, you can remove them from the freezer and air-dry or fan-dry the pages. It may seem like recovering from water damage is an overwhelming and slightly impossible task, but it doesn’t have to be. You can call on the highly trained Franchise Professionals at SERVPRO of Cape May County. We make it, "Like it never even happened.®"
Got Mold? We're here to make it, "Like it never even happened." Exposure to moisture, whether it’s from storm damage or a plumbing failure in your home or business, can provide the right situation for mold to flourish. The growth process can begin in as little as 48 hours, which is why it’s extremely important to know what steps to take and who to call for help with mold remediation. We’re sure that you’ve probably seen ads for mold remediation and mold removal, but the truth is that the latter of these two is false. Removing all mold from a home or business simply cannot be accomplished. Instead, a qualified restoration company focuses on mold remediation, and will work to achieve the goal of getting mold levels back to normal and natural ranges. Mold spores occur naturally almost everywhere, both indoors and outdoors. It is only when a minor mold problem is left untreated that the mold will become a major issue. During a mold remediation, technicians will isolate the mold-contaminated areas. Depending on the size of the remediation job, it can be done by either closing all doors and windows or completely sealing all of the doorways and openings with a polyethylene sheeting. Dust in the contaminated areas is then suppressed through misting. Wet and mold-damaged materials are removed and discarded in plastic bags, and all areas that have been exposed to and affected by mold are then completely cleaned and dried. In some cases, a HEPA vacuum may be brought in to aid in the removal of the contamination and debris. The area that is affected by the mold is treated with a biocide, and then left overnight to destroy and kill the mold spores. The mold remediation crew will return the following day and encapsulate the affected and surrounding areas. If you suspect that your home or business may have a mold problem, you’ll need to act quickly. Take a look at the size of the problem area and, if the moldy area is larger than 10 square feet, it is time to contact your local Franchise Professionals. 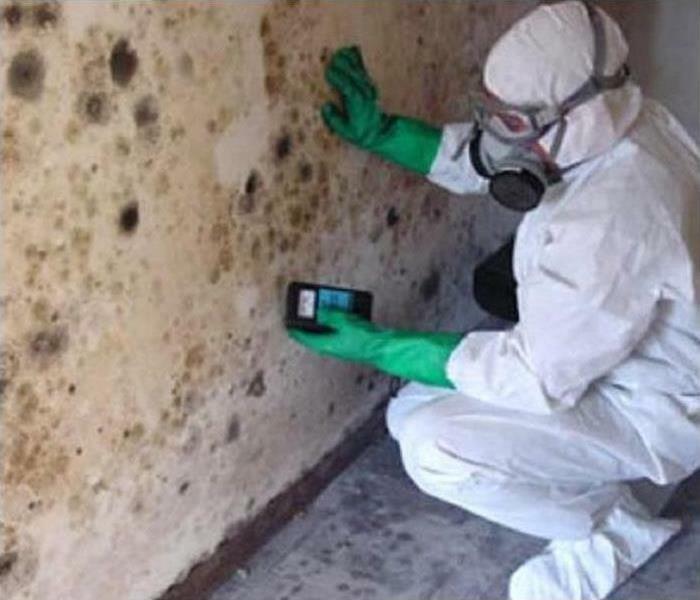 While some minor mold issues can be successfully resolved by home and business owners on their own, the safest way to deal with mold is to talk to the professionals to quickly and efficiently resolve the problem. At SERVPRO of Cape May County, our mold damage specialists are trained and certified in mold remediation. If your home or business is experiencing a mold issue, contact us to begin the mold remediation process. Call 609-624-0202 or email us. SERVPRO of Cape May County Offers Many Services! DID YOU KNOW? 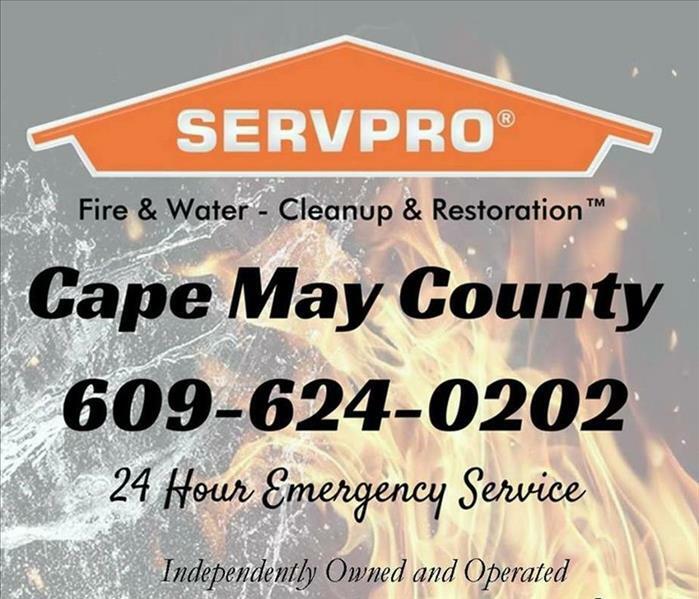 SERVPRO of Cape May County provides 24 hour emergency response and additional services to help customers with Fire & Water - Cleanup & Restoration and Mold Remediation! Board-ups/Roof Tarping/Property Securing - In some cases it may be important to secure openings to your home or structure using sturdy, durable materials designed to protect it from both weather intrusion and intrusion by outsiders. SERVPRO of Cape May County Franchise Professionals may perform the board-up and tarping themselves, or outside subcontractors may be utilized. Move-Outs - If prolonged exposure to the loss event could cause additional damage to your contents, your contractor requests relocation of the contents, or the safety of your contents is a concern, a move-out may be recommended. In these situations, SERVPRO of Cape May County Franchise Professionals are trained to properly inventory, move out and control the contents from the structure during the cleaning, restoration and deodorization process. Reconstruction Services - Once the damaged materials are removed from your home or business other construction may be needed to restore your property to preloss condition. Your local SERVPRO of Cape May County Professional is trained with the proper equipment to replace flooring, carpet, tile, hardwood floors, and doors (interior, exterior, steel and storefront). We can paint many surfaces, work on acoustic ceilings, trim, bathroom/kitchen remodels and home/office renovations. Inventory - Utilizing Contents Claim Inventory Service technology, SERVPRO of Cape May County Franchise Professionals can generate comprehensive room-by-room inventories. Contents are categorized as salvageable, non-salvageable and questionable - allowing for easier contents settlement. Electronics Cleaning and Restoration - Smoke residues can contain acids that corrode metal surfaces when moisture is also present. If the residues are not removed, corrosion can eat away at the metal casing and can ultimately cause electronic failure in the device. A SERVPRO of Cape May County Franchise Professional can clean the outside casing correctly, as well as refer your equipment to a qualified electronics vendor. Clean your fireplace or stove and have your flue checked for any buildup of creosote. Be sure other fuel burning equipment is properly vented to the outside. Insulate your home properly. If necessary, insulate walls and attics to conserve energy. Caulk doors and windows to keep cold air out. Install storm windows, or cover windows with plastic from the inside to provide an extra layer of insulation. Wrap pipes in insulation or layers of old newspapers. Cover the newspapers with plastic to keep out moisture. Turn both hot and cold faucets to continuously drip a little. Keep a wrench near the valves and know how to shut off your water valves if a pipe bursts. Cut away tree branches that can fall on the house during an ice storm or from heavy snow. Notify the utility company of branches that overhang power lines; do not attempt to trim by yourself. Replace batteries for smoke, and carbon monoxide detectors. If you did not do this when you set the clocks back, do it now. Have a back-up power source in place if you are dependent upon electricity for medical or mobility needs. Know where your snow shovel is located and have a supply of sand or a sand substitute. Prepare a warm, safe place for your animals in severe winter weather. Make sure any outbuilding that houses or shelters animals can withstand wind, heavy snow and ice. Bring pets indoors. Horses and livestock should have a shelter protected from wind, snow, ice and rain. Grazing animals need access to a protected supply of food and non-frozen water. Make sure your animals have access to high ground in case you do not have time to relocate them during a flood. Be aware of the potential for flooding when snow and ice melt. Consider purchasing flood insurance. Homeowners' policies do not cover damage from floods. Ask your insurance agent about the National Flood Insurance Program if you are at risk. Dress in warm, light layers and wear a cap for warmth. Eat well-balanced meals for energy. Use only safe sources of alternate heat such as a fireplace, a small well-vented wood or coal stove, or portable space heaters. Always follow manufacturers' instructions and never substitute one type of fuel for another. Clearing your roof is a dangerous task. Always think about safety first. If possible, do not attempt to clear the roof alone. When possible use long-handled rakes or poles. If you must use a ladder, make sure the base is securely anchored. Ask someone to hold the ladder while you climb. Make sure you do not touch electrical wires. If the job is too big for you, HIRE HELP. The information in this blog is from Ready.nj.gov (the New Jersey Office of Emergency Management). If you have water damage to your property, call the franchise professionals at SERVPRO of Cape May County, 609-624-0202. We are trained in water removal, dehumidification, and mold mitigation/remediation. We make it, "Like it never even happened.®"
Information for this blog obtained by redcross.org - when you have a water emergency, call the franchise professionals at SERVPRO of Cape May County, 609-624-0202. Prevent Water Damage in your Cape May County Home. How to Prevent Water Damage In Your Home. Preventing water damage is a lot cheaper than paying for repairs. Here are three easy prevention tips. Water damage is the No. 1 culprit that weakens your home’s foundation and what holds your house together. Here’s how to prevent water damage using three easy strategies that will give you peace of mind the next time heavy storms hit. Poor drainage weakens your foundation, causing cracks, uneven settling, and pathways for water to enter your home. Clean your gutters routinely. A clogged gutter will send cascades of water down the side of your house, damaging your siding and foundation. Ensure your downspouts direct water 5 to 10 feet away from your house. Sump pumps come to life during storms. That’s not when you want to realize yours isn’t working properly. You should check it at least once a year, and ideally perform several checks during heavy storm seasons. How to test your sump pump: Slowly fill the sump pump pit with water. Watch for the “float” (similar to the float in your toilet) to rise, which should turn on the pump. Then watch to make sure the water level falls. Test your backup pump the same way, but unplug the main pump first. If you don’t have a backup pump — or a generator — and are on municipal water, get one that runs on water pressure. If you’re on well water, your only option is the battery kind. Persistent leaks lead to mold and mildew, rot, and even termites and carpenter ants (they like chewing soggy wood, since it’s soft). Yet if you fix a leak soon after it starts, there may be no long-term damage at all. How to check for leaks: Check for dark spots under pipes inside sink cabinets, stains on ceilings, toilets that rock, and of course drips. At least once a year, inspect your roof. Repair missing, loose, and damaged shingles. Repair any cracked caulking and check for leaks around flashing. So now you know how to prevent water damage — and add years (and lower maintenance costs to your home!). Of course if water damage does affect your home, be sure to call us at 609-624-0202. September is National Preparedness Month. Your friends at SERVPRO of Cape May County want to be sure you are prepared for any disaster and will be sharing information all through September to help you and your family. First thing’s first. Make a plan today. Your family may not be together if a disaster strikes, so it is important to know which types of disasters could affect your area. Know how you’ll contact one another and reconnect if separated. Establish a family meeting place that’s familiar and easy to find. *Information obtained from ready.gov website. 3/31/2019 - A "Pawsitively Purrrfect" Idea! 2/21/2019 - Continuing Education Seminars - Save The Dates! 2/19/2019 - SERVPRO of Cape May County Offers Many Services! 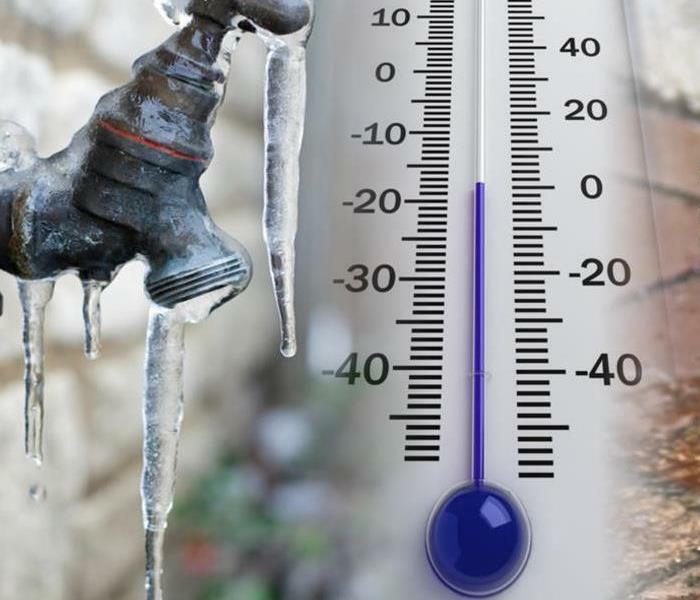 1/18/2019 - WHY PIPE FREEZING IS A PROBLEM! 9/3/2018 - Prevent Water Damage in your Cape May County Home. 8/20/2018 - September is National Preparedness Month.